EPR (electron paramagnetic resonance) based biological oximetry is a powerful tool that accurately and repeatedly measures tissue oxygen levels. In vivo determination of oxygen in tissues is crucial for the diagnosis and treatment of a number of diseases. 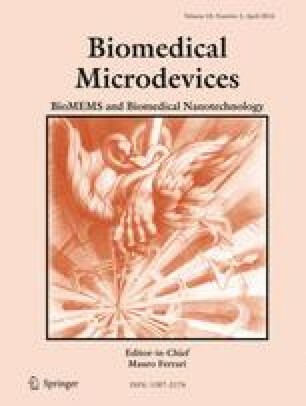 Here, we report the first successful fabrication and remarkable properties of nanofiber sensors for EPR-oximetry applications. Lithium octa-n-butoxynaphthalocyanine (LiNc- BuO), an excellent paramagnetic oxygen sensor, was successfully encapsulated in 300–500 nm diameter fibers consisting of a core of polydimethylsiloxane (PDMS) and a shell of polycaprolactone (PCL) by electrospinning. This core–shell nanosensor (LiNc-BuO-PDMS-PCL) shows a linear dependence of linewidth versus oxygen partial pressure (pO2). The nanofiber sensors have response and recovery times of 0.35 s and 0.55 s, respectively, these response and recovery times are ~12 times and ~218 times faster than those previously reported for PDMS-LiNc-BuO chip sensors. This greater responsiveness is likely due to the high porosity and excellent oxygen permeability of the nanofibers. Electrospinning of the structurally flexible PDMS enabled the fabrication of fibers having tailored spin densities. Core-shell encapsulation ensures the non-exposure of embedded LiNc-BuO and mitigates potential biocompatibility concerns. In vitro evaluation of the fiber performed under exposure to cultured cells showed that it is both stable and biocompatible. The unique combination of biocompatibility due to the PCL ‘shell,’ the excellent oxygen transparency of the PDMS core, and the excellent oxygen-sensing properties of LiNc-BuO makes LiNc-BuO-PDMS-PCL platform promising for long-term oximetry and repetitive oxygen measurements in both biological systems and clinical applications. This research was primarily supported by the Center for Emergent Materials, an NSF MRSEC under award number DMR-1420451.” (R.P.P and M.G.P), and by the Army Research Office (Award No. W911NF-12-1-0587) (V.P.B and C.M.P and P.C.H. ).